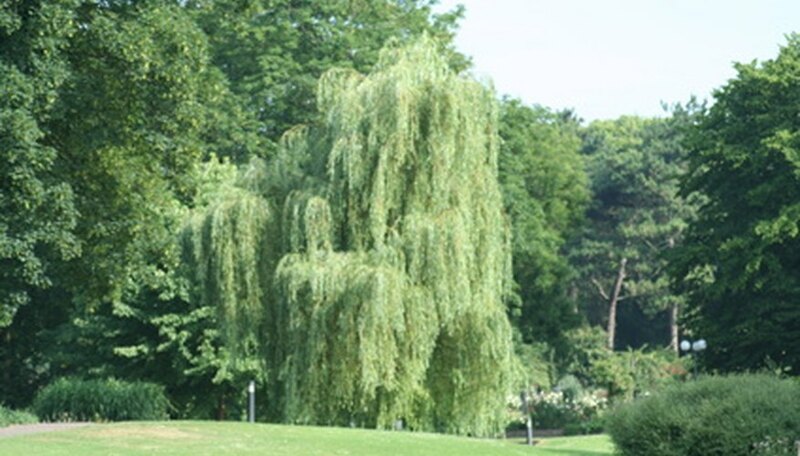 The weeping willow is a fast-growing ornamental tree featuring a wide crown of draping branches reaching to the ground. The willow reaches up to 50 feet in height and produces narrow leaves on lengthy branches. The natural growth pattern of this tree requires homeowners to train a weeping willow from first planting. The pendulous growth habit of this tree creates concerns about exposure to storm damage. Training the tree from first planting assists in the growth of a central trunk to give the tree added stability. Schedule training for late summer to early fall to encourage a healthy response from the weeping willow. Perform pruning during the first five years after planting to adequately control the shape of the tree. The object of pruning this kind of top-heavy tree lies in creating a central trunk as well as discouraging the formation of heavy top branches and side branches that lessen tree stability. Prune off ends of branches that sweep the ground using pruning loppers to make a sharp, clean cut. Make cuts at a 45-degree angle directly in front of a pair of leaves. Choose a height for trimming these trailing branches that provides adequate room for mowing under the canopy of the weeping willow. Examine the tree for sucker branches protruding from the ground around the base of the trunk. Clip these by cutting halfway through the branch and tearing back the sucker to discourage reformation of the sucker. Tackle upward-growing branches next by making pruning cuts flush with the connecting downward-growing branch. Examine the interior of the tree for crowding or bushiness that indicates a need for thinning. Carefully select randomly spaced branches to thin the crown of the tree to balance the crown with even thinning throughout the willow. Make 90-degree cuts using a tool appropriate for the branch size. Pruning loppers cut branches up to 2 inches in diameter. Use a pruning saw for larger branches and a pole saw for hard-to-reach areas. Always angle the cut and do not leave stubs that invite pests and disease. Look closely for dominant side branches that may attempt to form a split trunk. Prune off the large branch using a pruning saw with the cutting wound close to the main trunk. Allowing the weeping willow to grow in a V-shape invites a top-heavy tree that can't withstand wind or the weight of snow without cracking.